We must urgently cut greenhouse gas emissions (GHGs) if we are to live with a reasonably stable climate. The atmospheric space able to absorb further CO2 is contracting rapidly if we want to have a 50 per cent chance of staying below 2ºC average global warming. At current rates of emissions, it is reckoned that we will use up all of this capacity by 2033.¹ If we are to live up to the hoped-for ambition of the Paris climate summit this December, all options for achieving a big cut in emissions must be considered. There are multiple tools and measures to bring down GHGs. If used in combination, they will be more effective than relying on any one single measure. While I am far from being a market fundamentalist, a carbon tax is a particularly powerful means to achieve emission reductions. It gives a clear signal to everyone that we must move rapidly from a high- to a low-carbon world. It ensures that ‘the polluter pays’ – an important principle in addressing environmental externalities. And it builds confidence in our collective determination to create a low-carbon economy. The current slump in oil prices means that now is the time to establish a significant carbon tax, as business and consumers will feel less pain. A carbon tax should stimulate new technology and help prevent many low-carbon investments stalling, due to prolonged low oil prices. Pragmatism is essential when assessing the merits of a carbon tax against alternative measures, such as carbon quotas. Putting a price on carbon sends an unequivocal message to governments, business and the public alike: our global economy needs to shift to zero net carbon emissions as soon as possible, preferably by 2050. The tax on carbon emissions must rise substantially, giving a confident signal of the direction being taken by governments. When the UK introduced a carbon floor price in 2013, the Treasury assumed that carbon prices should be at £30 per ton by 2020 and £100 by 2030. However, many analysts consider a higher price will be needed globally, such as £75 by 2020 and £250 by 2030 if we are to achieve the scale of new investment needed in the low-carbon economy. Carbon taxes are levied on the carbon content of a particular activity and inform decisions made by diverse agents across the economy, from family firms and households to big companies and national governments. In the short term, such a tax will reduce the activity and associated carbon emissions, while in the medium to longer term it should achieve a shift in investment towards lower-carbon options. How fast it happens depends on the elasticity of demand (the sensitivity of demand to changes in price), levels of income and the ease of sourcing substitutes. There are concerns that differing carbon taxes between countries could risk ‘leakage’, where carbon-intensive companies will move from high-tax areas to those with low taxation, taking jobs and investment with them, at little or no benefit to the global atmosphere. This risk is one reason why we need a global approach to cutting GHGs. However, a single global carbon tax is unlikely in the immediate future, since countries face very different circumstances. 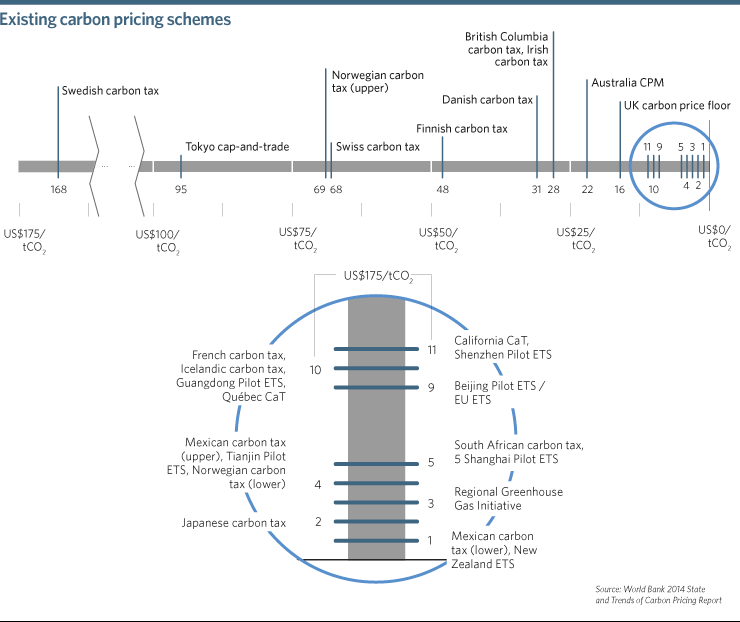 Carbon taxes are currently levied by a number of governments, including China, India, South Korea, Costa Rica, Japan, Sweden, the UK and Denmark. While no federal carbon taxes exist in North America, certain provinces or states have taken the lead, such as Quebec and British Columbia in Canada, and California in the US. All these examples provide valuable experience on how a carbon tax works in practice, including where the generated revenue goes. Sometimes, to avoid political opposition, the imposition of a carbon tax has been revenue neutral, so the levied income is taken off other taxes. Revenue from carbon taxes also provides welcome resources to cash-strapped governments to invest in climate resilience and public transport, subsidise energy efficiency and transfer to low-income households. Alongside establishing a significant carbon tax, governments must cut the big subsidies provided to the production and use of fossil fuels. These subsidies are delaying the transition to a low-carbon economy. Despite some countries, such as Indonesia, making bold changes to reduce fossil fuel subsidies, elsewhere they remain very large, at an estimated $550-$650 billion a year.² The main governments continuing to subsidise consumption of fossil fuels are Saudi Arabia, Libya, Algeria, Egypt, Bolivia, Argentina, Iran, Nigeria and Venezuela. Additionally, other countries, such as the US, provide significant tax relief on oil exploration and investment. Some argue that the establishment and distribution of quotas on emissions is a simpler, more direct process than a carbon tax. A specific cut in GHG emissions can be identified and responsibility distributed globally, then cascaded to regional, national and provincial jurisdictions. The agreement and distribution of GHG cuts across nations underpins the UN Framework Convention on Climate Change process of negotiation between different countries. The principle of “common but differentiated responsibilities” lies at the heart of the argument around how to distribute the cuts in emissions needed to keep climate change to manageable levels. The 1997 Kyoto Protocol established targets for rich countries alone, limiting its overall effectiveness, and several big emitters refused to sign up, such as the US and Australia. Today, it is recognised that all countries need to take on some action to invest in emissions reduction, by proposing Intended Nationally Determined Contributions (INDCs) to the global target of keeping within 2°C of warming. To date, the accumulated INDCs miss this target by a significant margin. 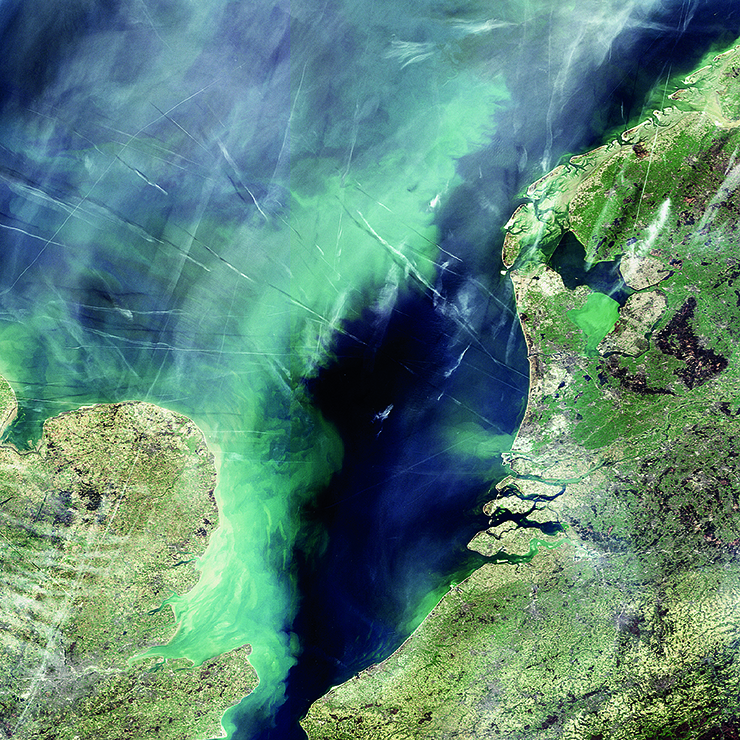 The European Union has used the distribution and trading of carbon emission permits to achieve targets consistent with their global responsibility. However, major flaws in the design and operation of the EU Emissions Trading System (EU ETS) have limited its potential. These include too many permits issued, the distribution of permits without auctioning and insufficient means to adjust quotas to changing circumstances. There are also high administrative costs to carbon quotas, both for the European regulatory body and the sectors directly concerned. The quotas only covered around half of total EU emissions. The process of distributing the permits without auction brought preferential benefit to those firms with high emissions and loss of significant potential revenue for government. Over-provision of permits created a collapse in the carbon price because firms were able to achieve emission cuts at lower-than-expected cost, and the economic recession led to a reduction in economic activity. So today, the resulting carbon price of €5 per ton gives little incentive or price signal to guide future investment. The European Parliament plans to retire a significant number of emission permits from the market in the hope of re-establishing a credible carbon price. But damage has been done to the integrity of the mechanism, which will take time to repair. Carbon cap-and-trade zones have been established in a number of other places, including seven Chinese cities and provinces, California, Quebec and South Korea. These have avoided some of the problems associated with the EU ETS, but suffer from high administrative costs of implementation, partial coverage of emissions (because they focus on large-scale sources of GHGs) and the risks of political influence in quota allocation. If we are to address climate change, and achieve the cuts in GHG emissions we desperately need, we should try all the policy tools in the box. A combination of government regulation and market-based mechanisms is needed, with regular review to learn how effectively they are achieving the goals. A carbon tax is a key measure because it is relatively simple to introduce and implement, and it establishes a very clear price for carbon that business and the public can build into their future plans. In a world of uncertainty and risk, governments can reduce policy uncertainty by giving a loud, long-term signal on carbon prices. The revenue raised can be directed at cushioning the cost for poorer households, investing in low-carbon research and development, and subsidising improvements in energy efficiency. Given the urgency of achieving emission reductions, it is important to set a common direction for everyone, whether they are involved in energy production, farming, transport, finance, oil production or construction. Establishing a carbon tax is the best means to do this. 1. Unburnable Carbon 2013: Wasted capital and stranded assets (2013). Carbon Tracker Initiative, Grantham Research Institute on Climate Change and the Environment, London. 2. Better Growth, Better Climate (2014). New Climate Economy Report, Washington DC, WRI.